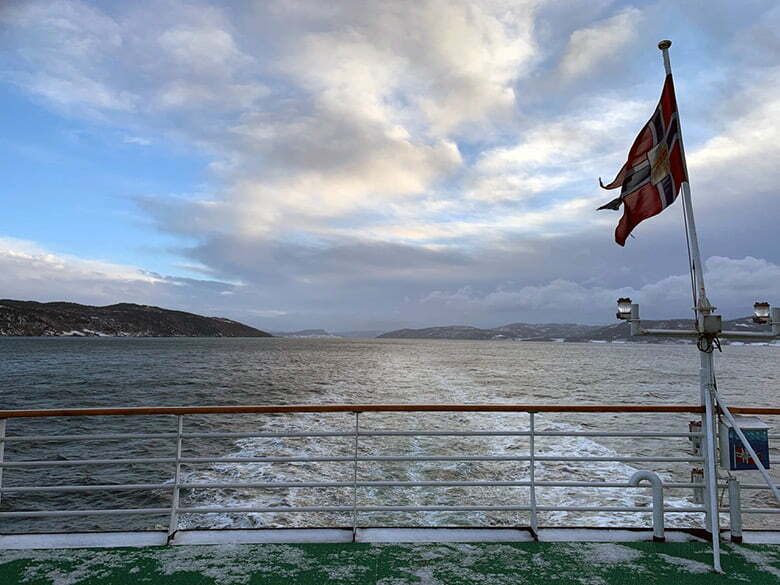 Hurtigruten Diary Day 3: A look at part of the famous coastal voyage that forms a vital part of Norwegian life but that many passengers don't even notice. My second night at sea following the day of storms was a lot easier to manage, and I slept for several hours. Fantastic! Those who said I would quickly adjust were quite right. It's amazing the difference even a few solid hours of sleep makes. 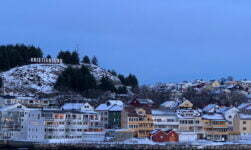 Day 3 of the Hurtigruten starts with a 6am arrival in Trondheim and a six-hour port stop, the longest on the voyage. 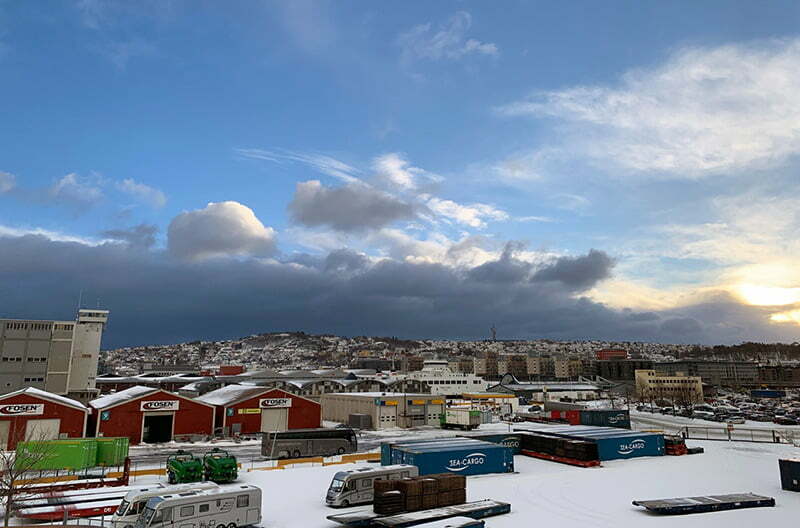 The storm must have overtaken us overnight, as we arrived to a Trondheim covered in fresh snowfall, giving an extra pretty edge to what is already a photogenic city. 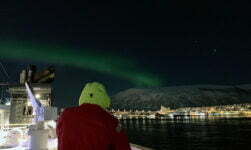 The Hurtigruten dock is quite a walk from the city centre. With conditions underfoot slippery and a very strong wind (remnants of last night's storm!) blowing in off the fjord, many passengers who hadn't pre-booked a bus/walking tour of the city chose to remain on board. As Trondheim is my home, I didn't join the tours, but neither did I stay on board. 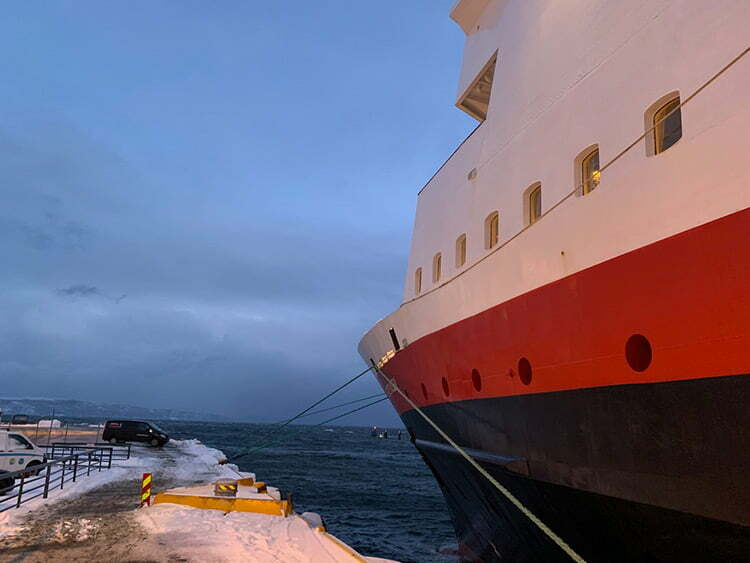 Instead I had arranged to meet one of the managers at Nor-Lines, a company that works almost seamlessly with Hurtigruten but many passengers won't know anything about. 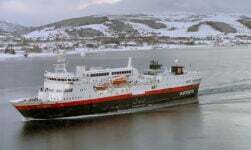 The Norwegian company Nor-Lines International is responsible for the shore-based cargo operations for all eleven ships in the Hurtigruten fleet. 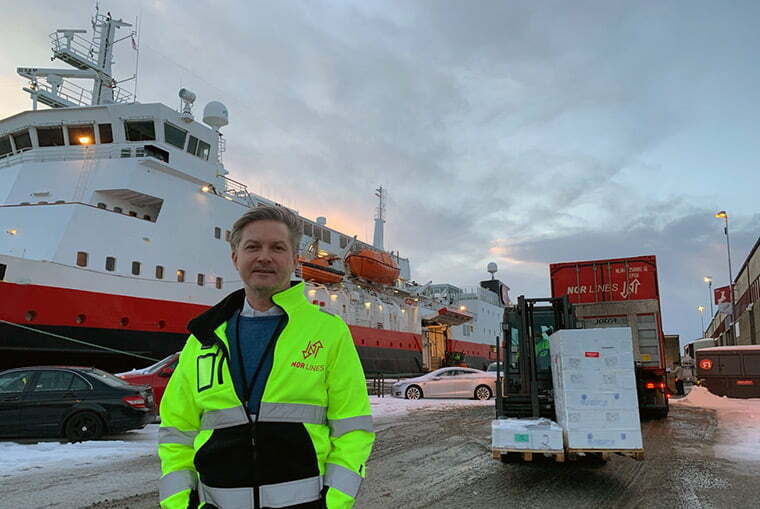 For my book research, I spoke to Per Anders Brattgjerd (pictured), Manager for Terminals and Agencies, and Oddgeir Hepsø, Cargo Manager, both based at the Trondheim terminal just steps from the Hurtigruten dock. 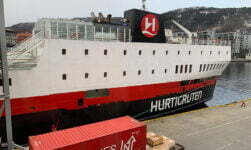 They described the variety of cargo that they load and unload on Hurtigruten vessels up and down the Norwegian coast. I saw fresh fish, boxes of chocolate, catering supplies, a snazzy snowmobile, and all manner of other items waiting patiently to be loaded. Aside from the weather causing issues with ship scheduling, they told me the biggest challenge is managing the available capacity. Because each shipment has a departure and arrival port that could be any of the 34 ports of call on the route, and each of the eleven ships has a different cargo capacity, the mathematics and organisation behind the operation is staggering. They work incredibly closely with the first officer on each ship, who is responsible for the cargo element of the operations. What left the biggest impression with me is how much these guys love their job, due to the unique nature of the Hurtigruten's cargo role and what it offers remote towns and villages all along the coastline. Despite how involved they are with the service, Per Anders has never taken the full Bergen-Kirkenes-Bergen voyage. “However, I have travelled on all vessels and have visited all our terminals, so I've done the full trip but not all in one go!”, he told me. As most people were asleep when we arrived in Trondheim this morning, a few of us stood on the outside part of Deck F to bid Trondheim farewell. 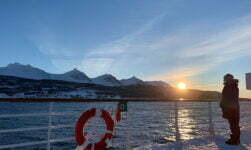 The Trondheimsfjord was much calmer than the waters we've encountered so far, although there were high winds. Because of this, the planned on-deck mussel tasting session presented by the Head Chef was moved inside into the Vesterålen lounge, handy for me as it's just a couple of steps from my cabin. 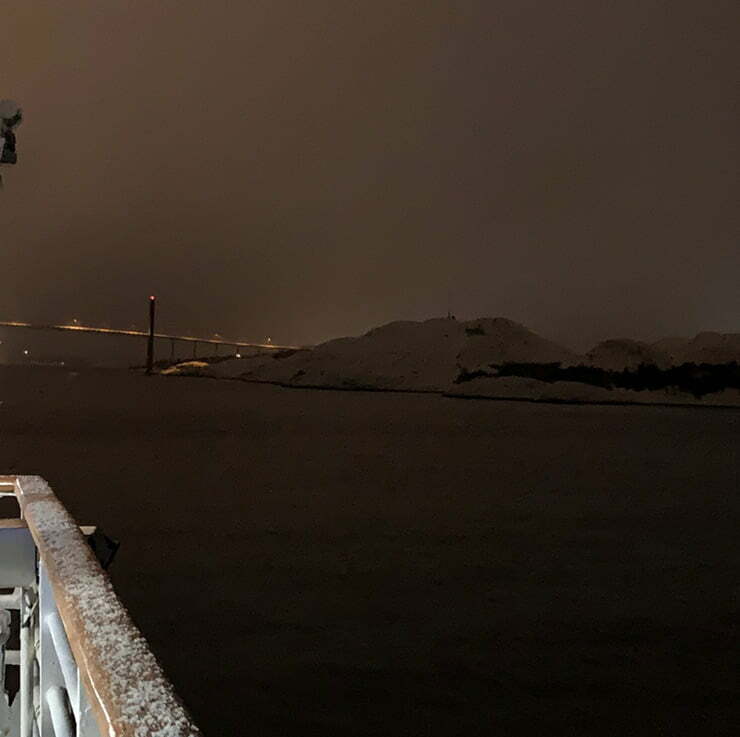 With the weather worsening and open sea ahead of us once more on the last section of our journey to Rørvik during the evening, the dinner seatings were brought forward from 6pm and 8pm to a single seating at 5pm. Frustrating, but the right decision as no-one wants to eat their dinner during a storm with the ship rolling! The ship did roll but not as much as on day 2, so hopefully now we are through the worst of the weather. Everyone seems to be expecting clearer skies, colder temperatures and calmer waters from here on in. Fingers crossed! Shortly after passing under the Nærøysund suspension bridge that signalled our arrival, the ship's hotel manager Steinar Olsen held a presentation and a Q&A session. There are 24 staff in Steinar's team (which includes cleaning and the restaurants) of a total of around 42 staff working on board. The number in his team can rise to around 29 in the busier summer season. I asked about whether he sees a difference in guests on the Vesterålen compared to other ships. He said the biggest difference he sees is actually between nationalities. 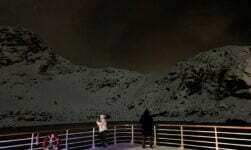 Generally speaking, more Germans ask questions about the technical aspects of the ship, more Brits ask about the landscapes and northern lights, and more Americans ask about the communities and social structure of Norwegian life. I see you write “snow scooter”, as I do after many years in Norway. 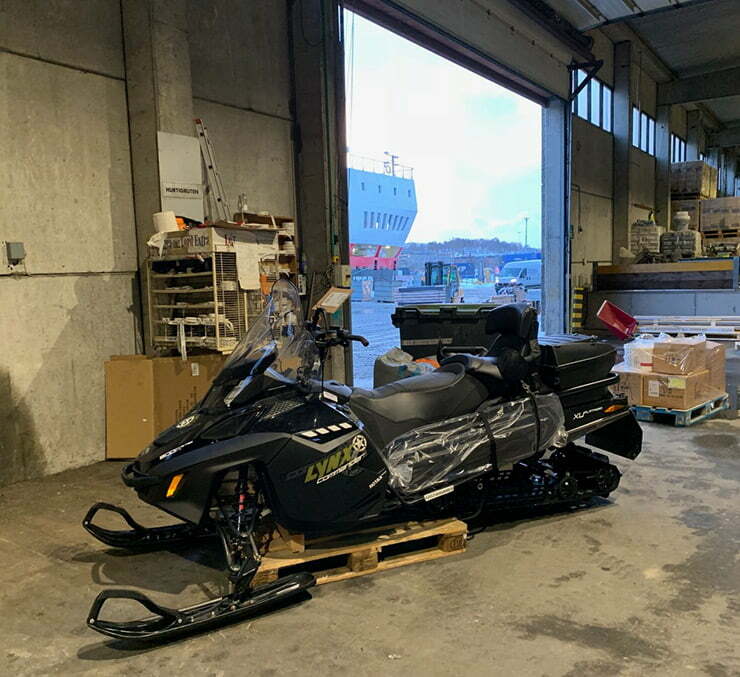 I think it’s a good description of the vehicle in English, but whenever I have checked on the net I usually hit snowmobile or even skidoo – both of which feel wrong to me (the former feels bigger, the latter is simply not true any more!) But in these days of electric scooters, perhaps snow scooter is wrong too. Tricky. I especially enjoyed your information on the maintenance and workings of the ships, something I didn’t know about. 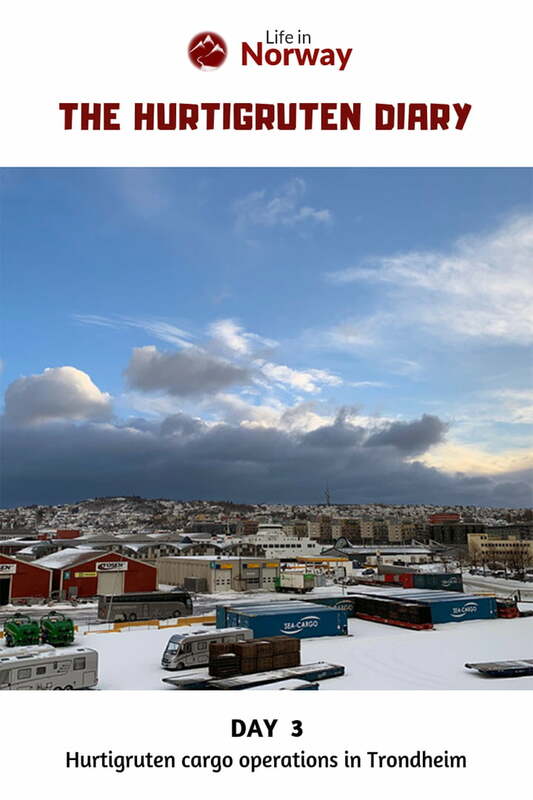 Also, your photos are great and Norway looks as beautiful in the snow as in the sunshine. Next time you sail and leave Floro for open waters, checkout ASKROVA ISLAND and THE HAMMERSETH FARM. THAT IS WHERE MY FAMILY BEGAN MANY, MANY YEARS AGO. Seeing the video of the weather was fun. We did the trip in May 2018, and had beautiful weather the whole trip. Not a drop of rain.